One of the easiest repairs you can make to your deck is making sure that any loose nails are removed and replaced with coated screws. Sometimes, nails are used in wooden deck construction, but coated screws are preferable because they tend to hold up better over time. At least once a month, give your deck a quick inspection to check for nails that are popping out so that you can remove them completely and replace them with coated screws. Loose railings can be a serious problem, especially if you have a raised deck. As part of your monthly deck inspection, check railings to ensure that they don’t wobble. If they do, you will need to reinforce the connection between the railing and the rest of your deck by adding more screws underneath. Keep in mind that a deck railing should never have more than a half inch or so of give. Over time, individual wooden decking boards may need to be replaced as they become rotted or otherwise damaged. While replacing a deck board may seem like a major project, it is actually quite simple. The key is to make sure you’re replacing the board with the same type of wood as the rest of your deck; this will ensure a seamless match once stain or paint is applied. New wood can be measured and cut with a circular saw; from there, all you need to do is attach the new board to the existing joists and ledgers using decking screws. Check underneath your deck for joists that are beginning to rot. Depending on the extent of the damage, you may be able to remove the rot itself with a screwdriver or putty knife before applying a sealant to prevent future rotting. In some cases, however, the rot may be extensive enough that you need to reinforce the damaged joist with a new one. To do this, simply cut a new joist using the same type of wood and dimensions; then, secure it tightly against the existing joist using deck screws placed at least every two feet. Over time, wood decks can develop mold and mildew growth. This can give your deck an unsightly appearance and also cause damage to your deck. Fortunately, you can remove mildew from your deck using a store-bought deck cleaner. Before applying the cleaner, you can also get rid of mildew and even algae by washing and scrubbing your deck with a bleach and water solution. The recommended mixture is about a cup of bleach for every gallon of warm water used. If you’re going to be replacing any wooden deck boards or joists, you’ll want to make sure that they’re stained or painted to match the existing deck for a seamless look. If your deck is already in need of a new stain or paint job, you might consider tackling this all at once to ensure uniformity; otherwise, you’ll simply need to stain and seal the individual new boards to match the existing ones. For the best results, you should usually wait a few months to seal and stain/paint new deck boards. This will allow time for any moisture retained in the wood to evaporate before sealing takes place. When it is time to stain and seal, consider purchasing an exterior stain or paint that has a sealer built-in; this will save you the time and hassle of needing to apply an additional coat of sealer later on. It’s also a good idea to carefully scrub/clean new deck boards before staining to ensure that the stain or paint will take well. If your deck is in bad enough condition, you may want to consider replacing it entirely. 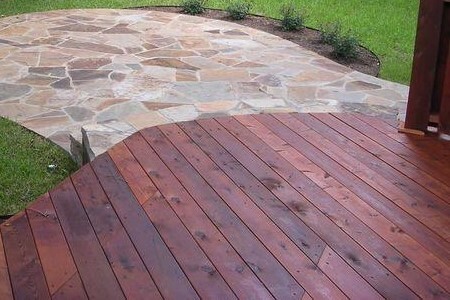 To get a beautiful and expertly crafted deck, contact Landscape By Design. Their landscaping experts can design and build a deck for your home that will last for many years.